In a day of 'conveyer-belt' converts the question may be asked, What is that faith that saves? In this volume Thomas Halyburton examines with masterly accuracy and powerful reasoning exactly what a biblical Christian is. In a feast of truth he exegetes, analyses and unveils the miracle of saving faith. Halyburton is a classic example of edifying Scottish theology and warm, passionate preaching. If you wish to understand how the Lord saves the sinner and where that life-changing event of justification occurs, then Halyburton on Faith and Justification is for you. T HOMAS HALYBURTON was born on 25th December 1674, the son of George Halyburton, minister of Aberdalgie and Dupplin in Perthshire until he was ejected from his charge in 1662 for his adherence to the Covenanted religion of Scotland. In 1676 George Halyburton was denounced by the Privy Council for keeping conventicles and was effectively silenced. In 1682 he died. Mrs Halyburton and her two surviving children – her married daughter Janet and her son Thomas – fled to Rotterdam, to escape the persecution of the Covenanters. In the changed circumstances brought about by the Revolution, Thomas Halyburton was ordained and inducted to the ministry of the gospel at Ceres in Fife on the 1st of May 1700. In April 1710 he became Professor of Divinity in the New College (St Mary's), St Andrews. A struggle with ill health characterised most of his ministry and on 23rd September 1712 he died, leaving his wife with six surviving children. He was buried at St Andrews beside Samuel Rutherford. Although Halyburton lived three hundred years ago and his public ministry occupied only twelve years in total, mostly in comparative obscurity, he has been regarded as one of the most distinguished Scottish theologians. Hugh Martin described Halyburton and Cunningham as "the two greatest theologians that Scotland has ever produced". John Duncan regarded him as "a minor John Owen", in the same category as Hermann Witsius, and classed his Memoirs with Augustine's Confessions and Bunyan's Grace Abounding. Among those outwith Scotland who benefited from and highly recommended theMemoirs and other published works of Halyburton are such varied and significant figures as George Whitefield and John Wesley, John Newton and Isaac Watts, and Archibald Alexander of Princeton. The impact of Halyburton's sermons and theological writings is largely explained by the description given of him in the Preface to one edition of hisThe Great Concern of Salvation : "one that had the contents of the book written upon his own heart before he preached them to his people and was a living and lively witness and example of the great and grave truths now exhibited to public view". Even his most technical and controversial work, Natural Religion Insufficient and Revealed Necessary to Man's Happiness in his Present State, a refutation of Deism [which taught that all that needs to be known of God can be discovered by human reason in the light of nature without special revelation], found much of its impetus in his own spiritual struggle with the atheism of his carnal mind strengthened by Deistic reasonings and in his pastoral concern for others who might be subject to similar conflicts. The works and sermons contained in this volume illustrate the theological insight, varied Christian experience and pastoral heart of the author. Obviously much indebted to the English Puritan, John Owen (1616-1683), Halyburton is more plain and popular in style. Modern readers may initially have difficulty with the numerous sub-divisions and some expressions (the "Scottish idiom" as Newton put it), but those who with Newton "prefer truth to ornament" will find that careful reading brings much enlightenment to the mind and benefit to the soul. Even the subdivisions may become aids to clarification and reflection. An Essay concerning the Nature of Faith; or, The Ground upon which Faith assents to the Scriptures [which is reproduced in the first three chapters of this edition] is an explanation of the apostle's determination to preach in such a way "that your faith should not stand in the wisdom of men, but in the power of God" (1 Cor. 2: 5). The English philosopher John Locke (1632-1704) only accepted aspects of the Christian faith which were "above reason" on the basis of authority verified by reason. For him "reason must be our last judge and guide in everything". Against him Halyburton contends that a God-given faith "looks only at the Lord's authority ... it leans only on the testimony of God, approving itself such to the souls of believers by its own glorious power, whereby, without borrowing help from any other signs, it evidences itself to be the Lord's word, with a light so strong as carries the soul into an assent". A recognition of the nature and ground of faith as explained here will deeply affect one's view of the Word of God, the content and method of preaching and the tests to be applied to professed faith. A Modest Inquiry whether Regeneration or Justification has the precedency in Order of Nature [which is reproduced in the fourth chapter of this edition] is not a dry exercise in abstract or merely theoretical thinking but provides a perceptive and edifying account of how all the blessings of salvation, including faith to receive them, are connected with Christ and with the various aspects of the union with Christ provided for in the Covenant of Grace. 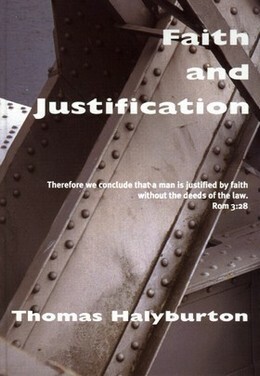 An Inquiry into the Nature of God's Act of Justification [which is reproduced in the fifth chapter of this edition] gives good accounts of saving faith and of justification viewed from various angles but specifically deals with the way in which God makes known their justification to His people, or "how God gives out sentence in the sinner's favour". The Sermons reveal the Biblical source and experiential and practical applications of Halyburton's theology. Readers will find that he is concerned to expound the doctrine of his text and to confirm it from other Scriptures. His preaching is Scriptural, takes account of the context, is doctrinal and methodical and packed with matter. It is his concern to exalt the free grace of God and humble the sinner before His mercy seat. He applies truth to character, experience and practice and shows its relevance to the various conditions of his hearers. Primarily, his preaching is Christ-centred and evidently the Christ whom he proclaimed to others was One whom he himself knew and loved. The combination of sanctified intellect and gracious experience found in Halyburton provides us with material which illustrates the comment of Rev Dr Robert Burns, editor of the 1833 Edition of Halyburton's Works, that "experimental religion ... is neither more nor less than the practical application of the great truths of religion to the particular cases of individuals ... the practical efficacy of Christian doctrine exemplified in the heart and on the life ... Christianity brought home to 'men's business and bosom'". The publishers of this selection of Halyburton's works are to be commended for their venture of faith and it is to be hoped that its reception will be such as to encourage them in their intention to reproduce the remainder of Halyburton's extant works in uniform volumes. It would indeed be a good sign should there prove to be an appetite for Reformed doctrine which is manifestly intended to influence the experience and the conduct as well as satisfy the mind. It is an honour to be associated even in this minor way with this endeavour to let the twenty-first century hear the voice of one so signally used throughout the past three centuries to direct the attention of sinners to the Lamb of God and to the nature of true religion. – Rev. H. M. Cartwright, Edinburgh, 2000.